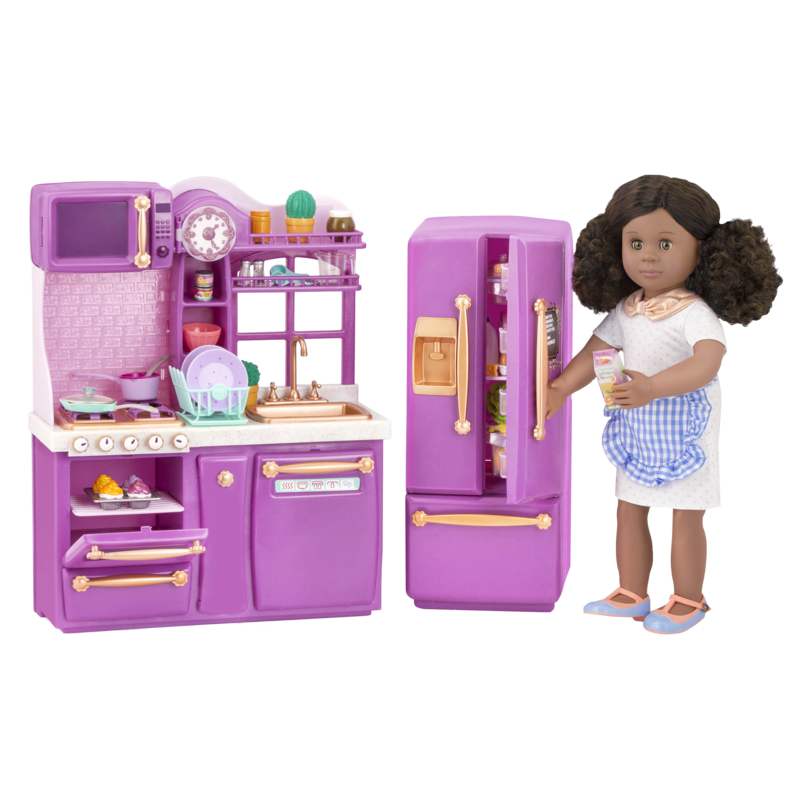 https://s3-ca-central-1.amazonaws.com/media.ogdolls/20181129161311/BD37410-Gourmet-Kitchen-Set-Purple-all-components.png Category: House and Home. 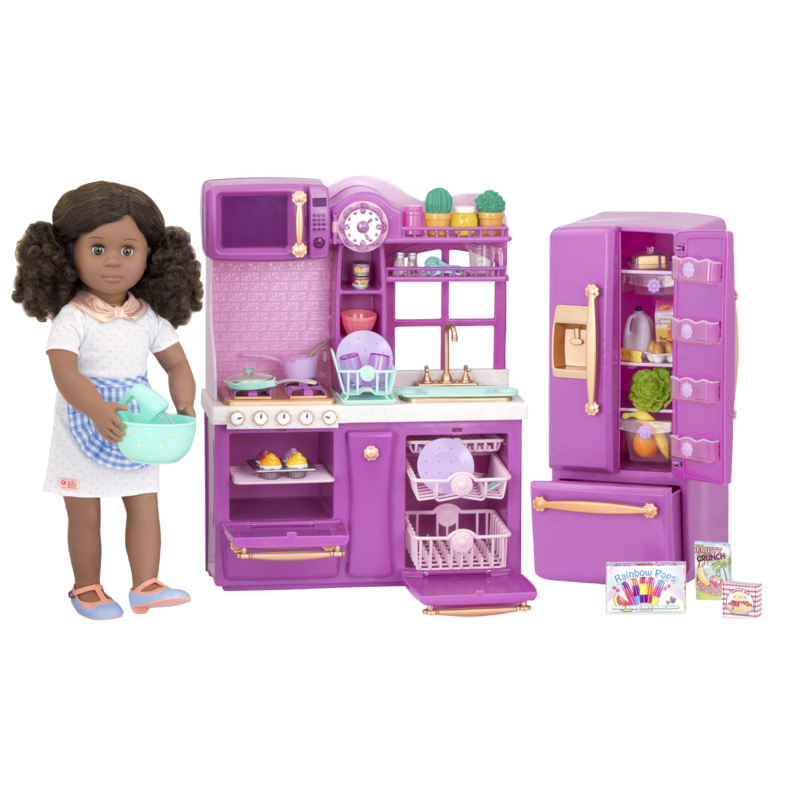 Cook up something delicious with this toy kitchen set for 18-inch dolls! 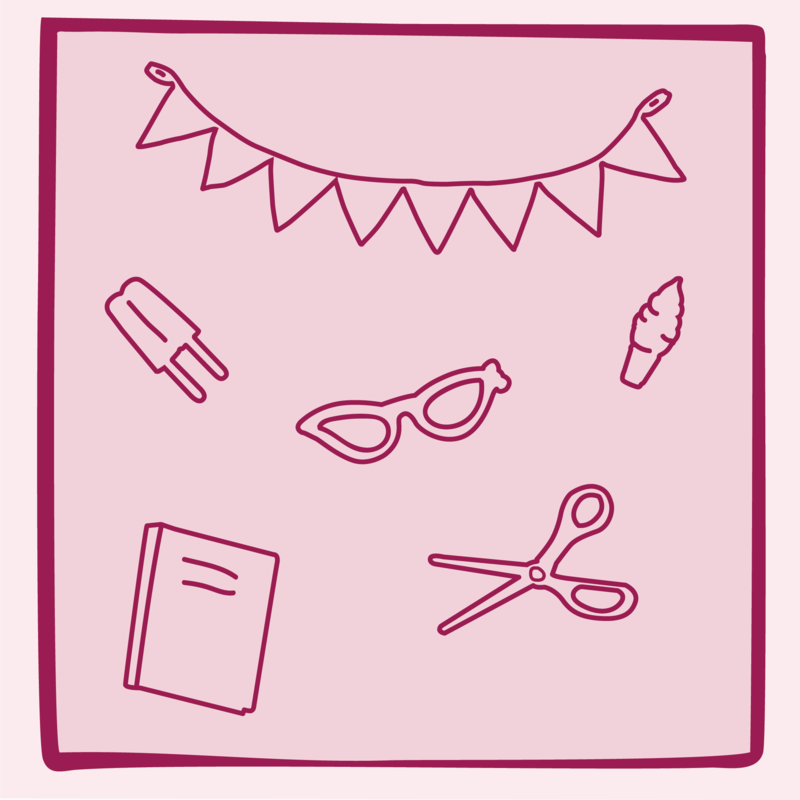 There is always something fun to make in the kitchen! 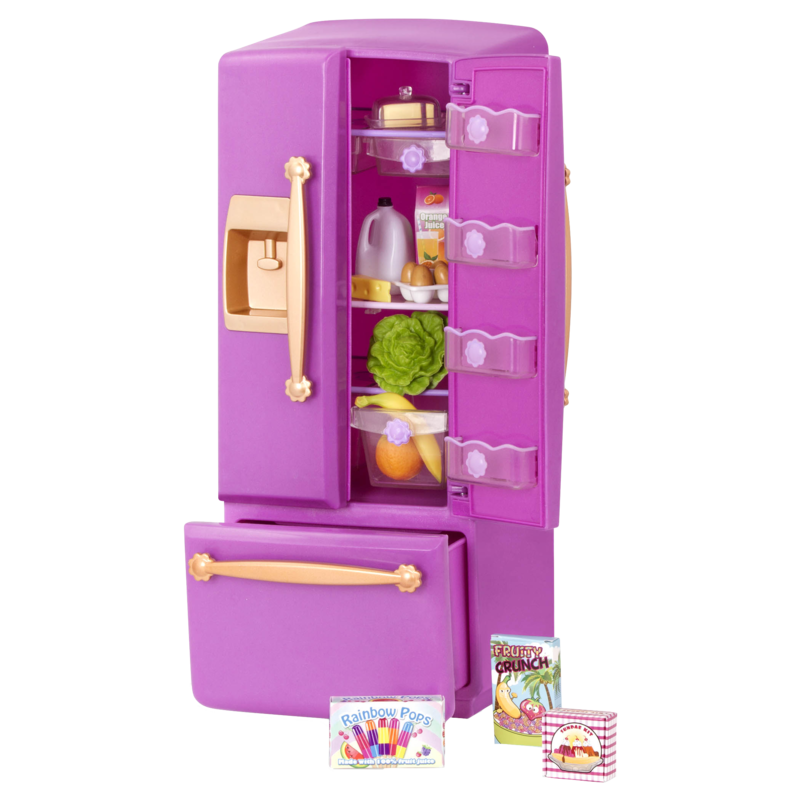 Get inspired to cook your dolls delicious and interesting food with the Our Generation Gourmet Kitchen Set – Lilac! 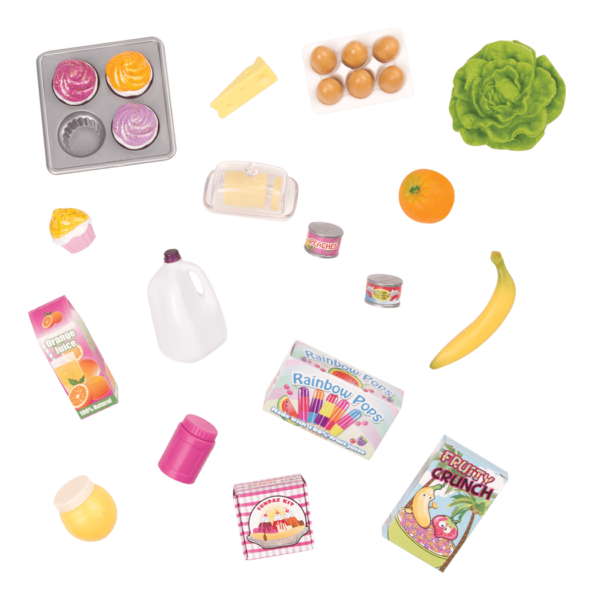 This 71-piece kitchen playset for 18-inch dolls has oodles of realistic accessories for complete kitchen playtime fun! Because we are an extraordinary generation, us girls. Sure, we’re cute. But we’re also curious, clever and ready for anything. We’re painting each fingernail a different color, helping keep forests beautiful by recycling and seeing who can hold their breath the longest. And we’ve got what it takes to take ourselves to the moon and back. Together, we’ll help each other become astronauts. Or not. (Because that’s okay, too.) This is our time. This is our story. 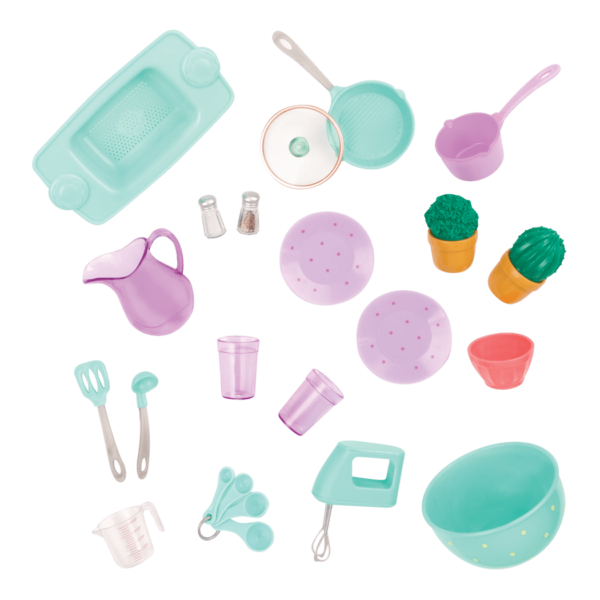 Toy Kitchen Accessories for 18-inch Dolls! We get recipe inspiration from the pros, like our parents and grandparents. They always have the best recipes! 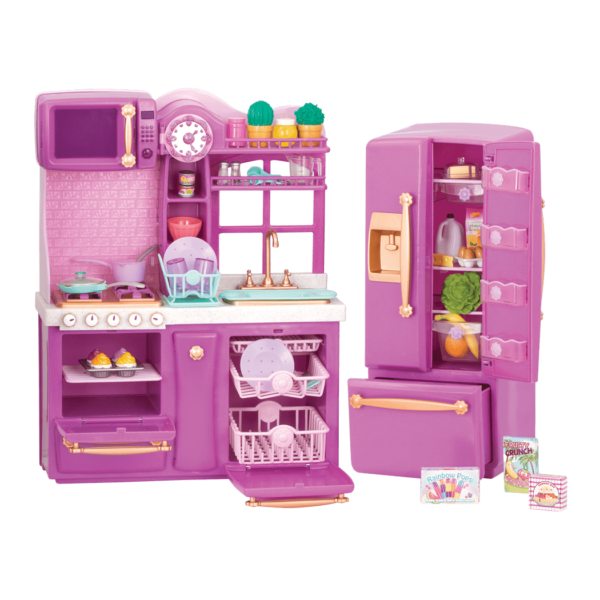 The kitchen unit in a bright purple color has a microwave, oven, dishwasher, and lots of counter space, cupboards, and shelving. 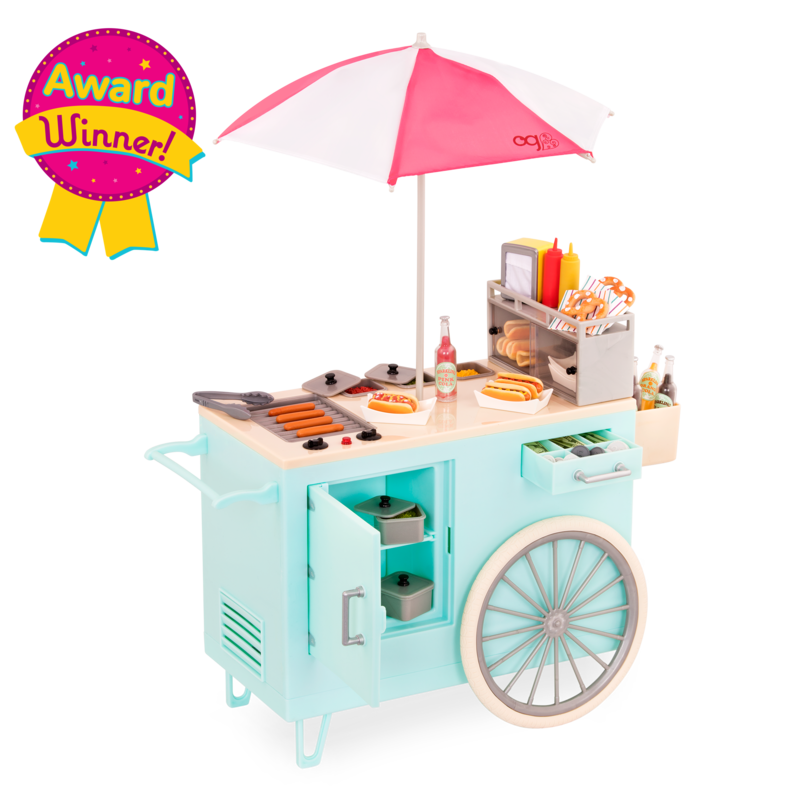 The movable refrigerator has two sides that open, shelves, and a bottom-load freezer for keeping all of your doll’s groceries fresh. Should it go to the left or the right of your kitchen unit? You decide! 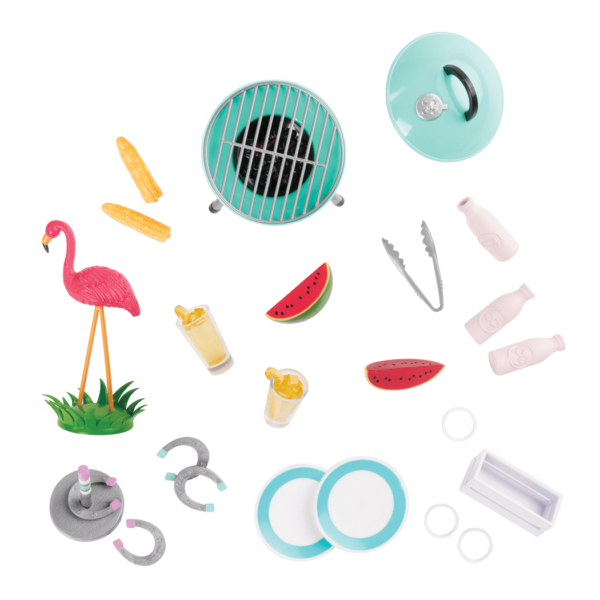 Lifelike accessories like the hand mixer and muffin pan are even more fun, and the selection of pretend food will give you the perfect ingredients. Have you met Nahla, the doll in the pictures? Nahla learns a lot about where food comes from in her book “A Garden Where Friendship Grows”! If you and your dolls want to try growing their own vegetables to cook in your awesome Gourmet Kitchen Set, check out the Way to Grow doll gardening set, which has a little planter, seed packets, and other great tools so your dolls can grow something delicious for dinner! Once your dolls have “cooked everything to a T” (does anyone know where that expression comes from?!) 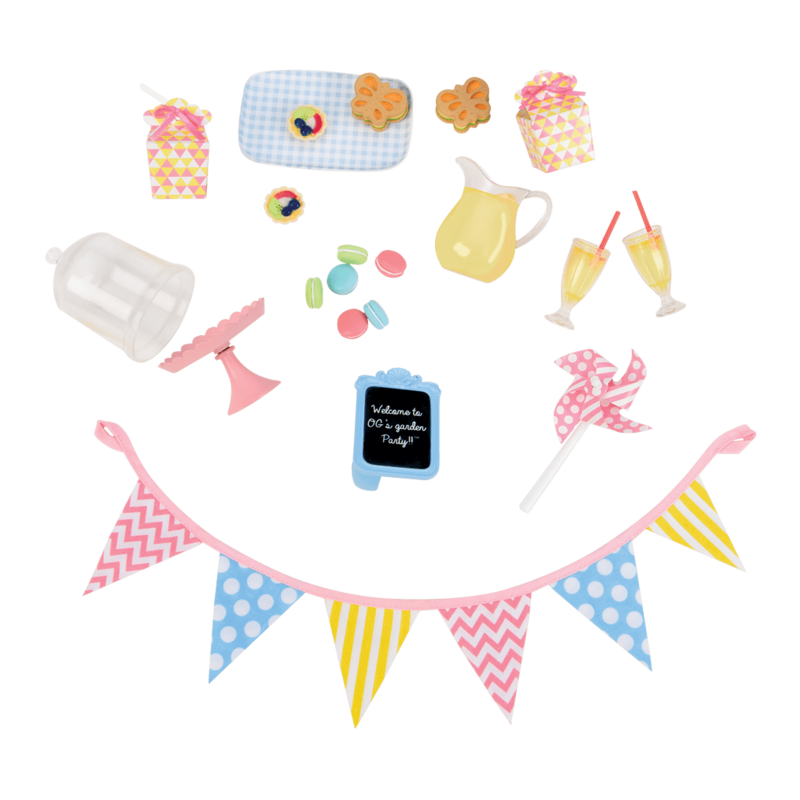 with all of their fantastic baking accessories, they will need somewhere to sit down and eat! 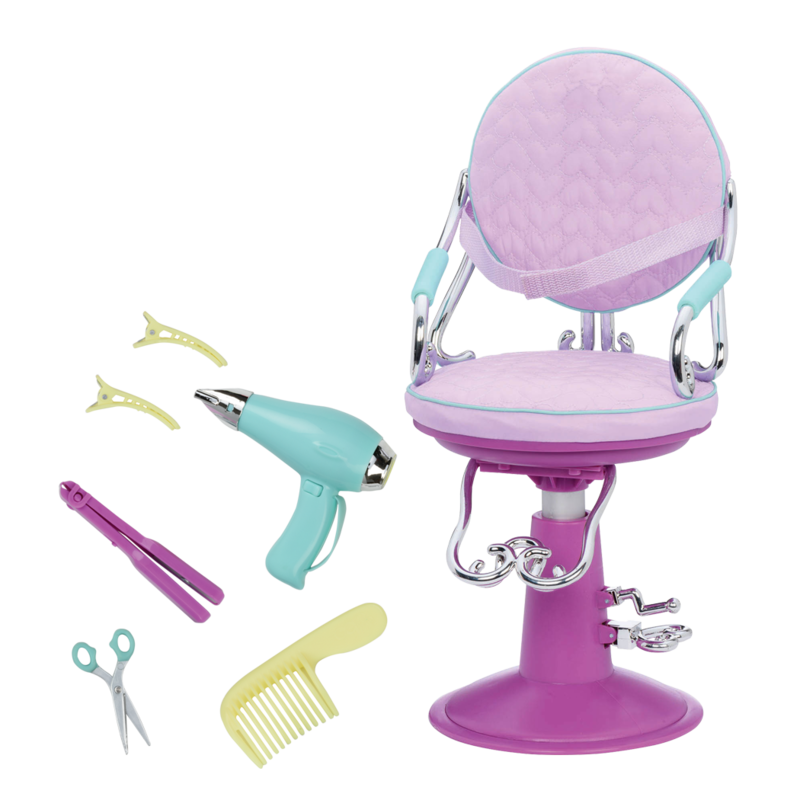 The Table for Two Furniture Set has everything your dolls will need including placemats, a table, and two chairs. Bon appetit! This is a cute little kitchen, but it could be used more food. I have both the orange, and purple kitchen sets, and I think I like the orange one better cause it had more food, and accessories than this one. Don’t get me wrong, this is a cute, spectacular kitchen and I’m enjoying both of them. Kitchens are family places. For people who have lots of dolls this would be a great set !